Harry Bober (1915-1988) was born in Brooklyn, New York. He entered the City University of New York with a desire to study painting. He was encouraged by the chair of the CUNY art department to change his major to art history. He received his M.A. in 1940. During W.W.II he served in the U.S. Navy. After the war Bober continued his studies in art history and earned his Ph.D. from NYU in 1949. Harry’s scholarly interest was in medieval art. His dissertation was on the medieval Book of Hours. During his long and distinguished career he authored numerous scholarly papers, articles and books. He taught at Queen’s College, Smith College, John Hopkins University and Harvard University. In 1954 he joined the NYU faculty as a professor of medieval art at the Institute of Fine Arts. He remained there until his death in 1988. 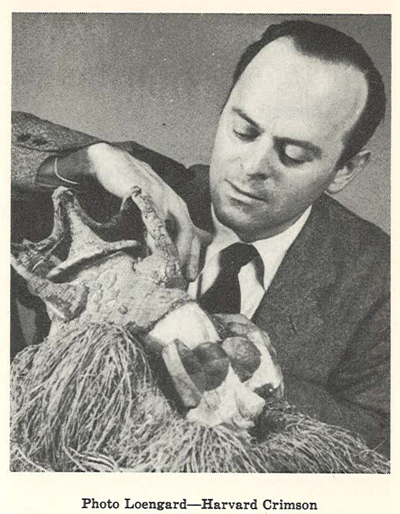 In 1964 Bober was named the first Avalon Foundation Professor of the Humanities at NYU. In addition to his academic career Harry was a founding member of the Board of Directors of the International Foundation for Art Research. During his life Harry was active as a consultant to museums, private collectors and art dealers. He assembled a fine collection of mediaeval art. A number of his pieces were included in the 1968 Metropolitan Museum’s exhibition of medieval art assembled from private collections. In 1975 Harry was invited to curate the Metropolitan Museum of Art’s exhibition entitled “The Passover: An Exhibition” for which he authored the catalog for the exhibition. I first met Harry in the early 1960’s when he was invited by Southern Illinois University Department of Art to serve as a distinguished visiting scholar teaching a series of seminars on medieval art. Early in his residency I looked up from my work in my studio to find him watching me. He asked me about a sterling toy I was working on and expressed interest in my metal working processes. That discussion was the first of many to follow. He was interested in metal forming, joining, and embellishing techniques. Often our discussions would lead me to demonstrate various aspects of metalwork that especially interested him. Prior to our first meeting I had read the book, On Divers Arts: The Treatise of Theophilus written by a Benedictine monk in 1100AD. The book consists of three sections, one on painting, another on glass, and the last on metalwork. All three media topics were concerned with the execution of religious art. We had many discussions of that book as well as conversations on ancient and medieval metal work. His knowledge of medieval icons and stylistic images was fascinating to me. He had an indepth knowledge of The Sutton Hoo Treasure and was kind to answer my many questions about the find. During one of our early planning sessions for the first SNAG conference I was named the conference chairman. I suggested the Harry Bober be invited to be the keynote speaker. I felt that a presentation on The Sutton Hoo Treasure would be of great interest to an audience of metalsmiths. Harry was delighted to be invited and was so pleased to participate that he remained a friend of SNAG for a number of years. From the early 60s into the 70s Harry and I developed a friendship staying in touch by phone calls and lunching together when I was in New York. He owned a piece of my work and generously introduced my work to gallery owners, collectors and his friends. The last time I saw Harry was during the 1971 SNAG conference at The Metropolitan Museum of Art. Bob Ebendorf had also developed a friendship with Harry and invited him to be a guest at SNAG’s 1971 conference banquet. Bob remembers conversations with Harry about enamel on medieval metalwork. Harry was particularly passionate about enamels, I expect because of the relationship to the pictorial imagery found in Illuminated books. Harry had a long and very distinguished career. As a scholar he made many important and valued contributions to his field of study. He was certainly a friend of SNAG, understanding the mission of the studio artist/craftsman working in the media of metal. As an advocate of our field he is certainly deserving of the honor of being given the Lifetime Achievement Award of the Society of North American Goldsmiths.